The market is segmented by Purpose (Detection, Protection, Decontamination, Simulation and Training), Application (Military, Civil and Law Enforcement), and Geography. 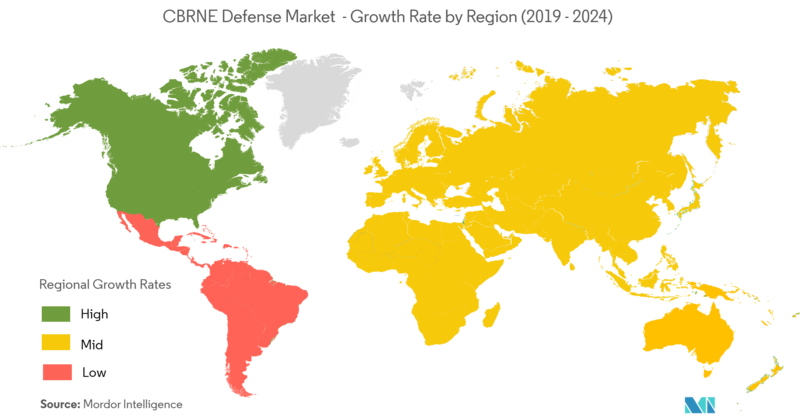 The CBRNE defense market is estimated to grow at a CAGR of over 4.5% during the forecast period 2019-2024. The CBRNE defense market is growing with the increase in the number of terrorist attacks worldwide using CBRNE agents for carrying out the attacks. The increase in the number of threats as well as attacks carried out by making use of chemical, biological as well as radioactive weapons, in the recent years, have led to various governments worldwide increasing their security measures. The emergence of the “new terrorism” which is characterized by religious and apocalyptic extremist ideologies has been the primary reason behind the growth of usage of CBRNE as a weapon for the terrorists. The easy availability of CBRNE weapons for warfare shall lead to a growth in the CBRNE defense market in the years to come. Advanced technological developments such as the Scorpion Robot, which has been developed by Endeavor Robotics is expected to provide growth opportunities for the market in the years to come. The Scorpion Robot is an Unmanned Ground Vehicle (UGV) which weighs less than 25 lbs. The robot can be used by Explosive Ordnance Disposal (EOD), Infantry and other Soldiers which shall help global military forces to tackle extreme CBRNE challenges. Moreover, the robot can also provide situational awareness to the military by making use of the in-built multiple cameras. Additionally, the open end architecture design shall allow the Scorpion robot to be configured quickly for EOD, Infantry or CBRNE missions. Chemical, biological, radiological, and nuclear threats have collectively come to be known as CBRNE threats, and actualization of the threats as CBRNE incidents. These include attacks using NBC weapons, or otherwise called weapons of mass destruction (WMD). Chemical, biological, radiological, nuclear, and explosives defense are protective measures which are taken in situations in which chemical, biological, radiological or nuclear warfare (including terrorism) hazards may be present. CBRNE defense consists of CBRNE passive protection, contamination avoidance and CBRNE mitigation. Currently, the military has the highest share out of all the segments. With growing threats from terrorists and rise in political tensions, CBRNE weapons have emerged as a potential threat for several countries. Governments and defense departments of several nations are developing robust and effective countermeasures, in order to protect the public and military personnel from CBRNE weapons. The primary reason for the growth in this sector is that various countries around the world are engaged in CBRNE defense procurement. The counter-terrorism officers in the UK are in plans to equip their fleet with 10 nuclear and radiological detection vehicles in a bid to trace weapons-grade materials in the UK. Additionally, the Netherlands Army plans to procure new chemical, biological, radiological, and nuclear (CBRNE) reconnaissance vehicles for their fleet. Moreover, the Netherlands army also plans to increase the operational lifespan of their 12 armored vehicles for CBRNE reconnaissance. Additionally, new reconnaissance capabilities shall enable the Royal Netherlands Army to effectively detect and identify all CBRNE-relevant substances. Thus, upcoming developments shall increase the focus on this segment, and this shall be the reason for its expected high CAGR. 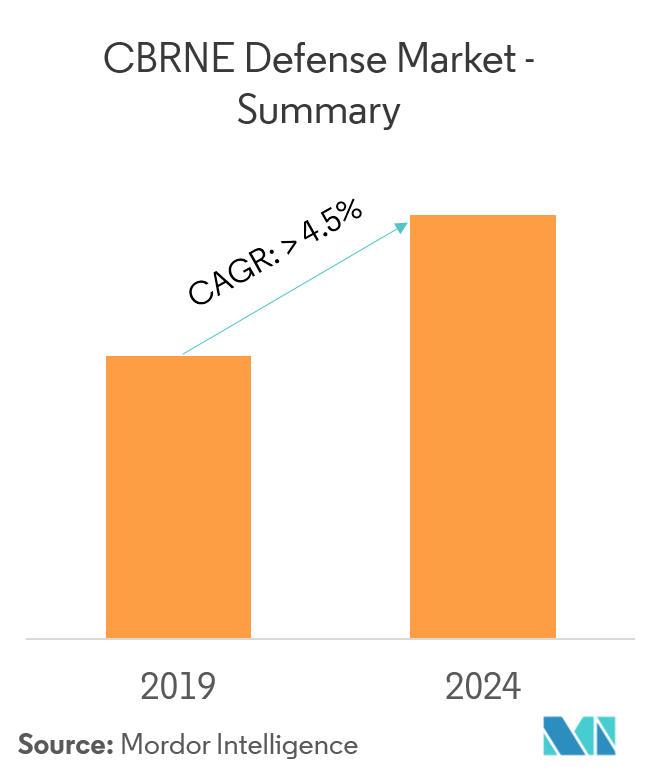 In the CBRNE defense market, regionally, North America is generating the highest revenue at present. North America is witnessing an increase in the number of developments related to CBRNE defense. The US Army trains all their army soldiers, pursuing a career in CBRNE Defense at the Army CBRNE School at Fort Leonard Wood. The US Air Force also trains its airmen, who are pursuing a career in counter-CBRNE operations in the same school at Fort Leonard Wood. Companies such as Airboss Defense, a subsidiary of AirBoss of America Group are engaged in the manufacturing of up to 1,620,000 pairs of AirBoss Molded Glove (AMG) chemical, biological, radiological and nuclear defense (CBRNE) protective gloves. The glove has been developed to provide optimal fit, comfort, dexterity, tactility and fully integrates with all currently fielded CBRNE suits. Thus, various upcoming developments in the North American region shall lead to a positive impact on the growth of the market. 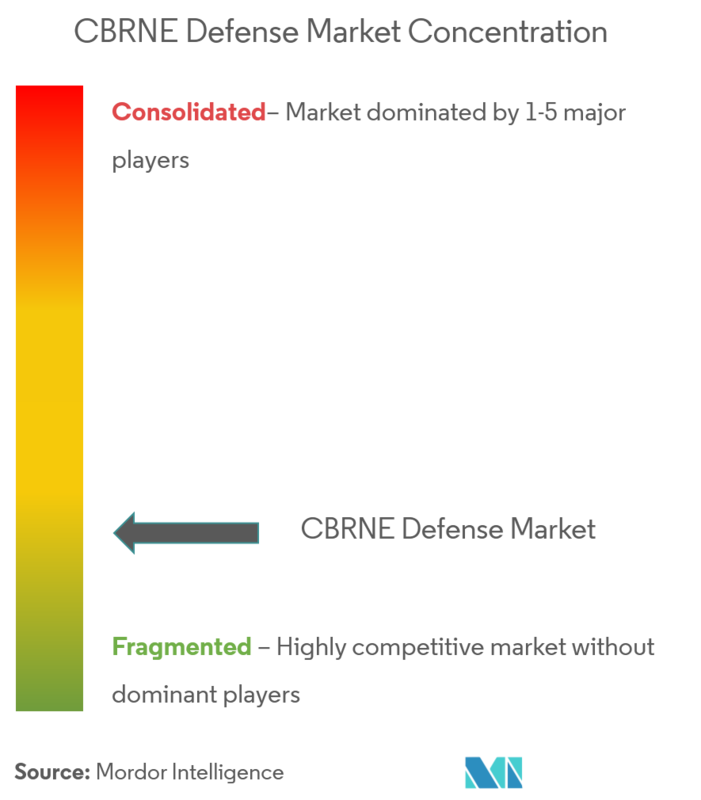 Various players are occupying significant market share during the forecast period in the CBRNE defense market. In 2017, the US Army announced that they have awarded 170 companies a potential 10-year, USD 8.27 billion contracts in order to help in research and development of chemical, biological, radiological and nuclear defense systems. 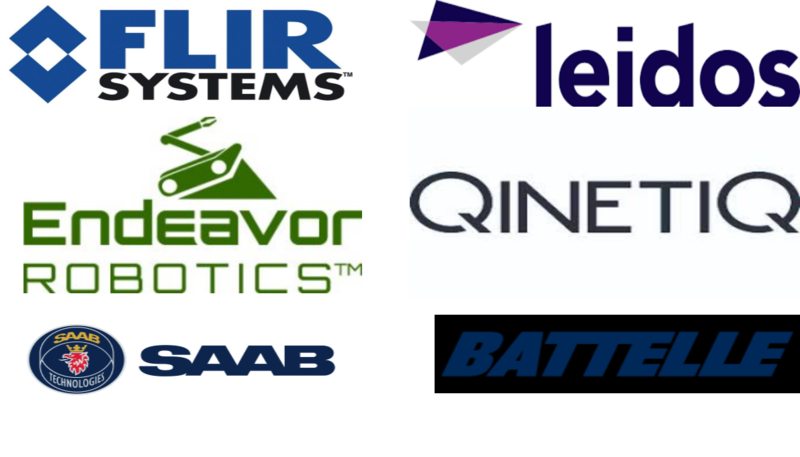 Companies such as FLIR Systems in 2018 have received orders for delivering of chemical, biological, radiological and nuclear reconnaissance dismounted kits, sets and outfit systems to the US army. The introduction of advanced technology robots for conducting of CBRNE missions as well as strategies such as focusing on building trust with the stakeholders, lowering of product costs and increasing product awareness shall lead to major players gaining traction in the market during the forecast period.